The new edition of the Rough Guide to Accessible Britain has intensified focus on ‘invisible’ disabilities, such as autism and mental illness. The Guide, just published, which has a foreword by Chris Packham, has included for the first time information for visitors with these more hidden conditions. The Guide, in its 10th year, offers useful information such as availability of ramps, accessible toilets and parking spaces, as well as quiet mornings, picture stories or bespoke queuing arrangements. Inclusive and accessible days out include museums and art galleries, wildlife parks and gardens. The venues have been checked by a Rough Guide team member who either has a disability or is accompanied by a disabled friend or relative. New entries for 2018 include Windsor Castle, RSPB Bempton Cliffs, Monkey World, Hyde Hall, Essex, and Sandcastle Waterpark, in Blackpool. Rough Guide has worked with the National Autistic Society to include relevant information for neuro-diverse visitors. 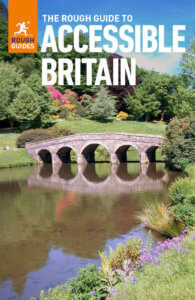 The refreshed and enhanced Rough Guide to Accessible Britain is now available online at accessibleguide.co.uk. This latest edition of the Rough Guide has been welcomed by PA Pool, a website that also aims to help disabled people take more control of their lives, by managing their own private care recruitment or employment.